What is New York’s Lien Law Section 76? Pursuant to Lien Law Section 76, a beneficiary of a trust may, after thirty days of an unpaid trust claim, serve a demand requiring the trustee to verify the entries on the books and records of the trust. By law, the trustee must provide the verified statement within ten days of the time that the demand was served. 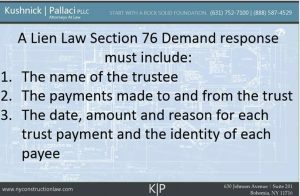 What Information is Required to Satisfy Lien Law Section 76? 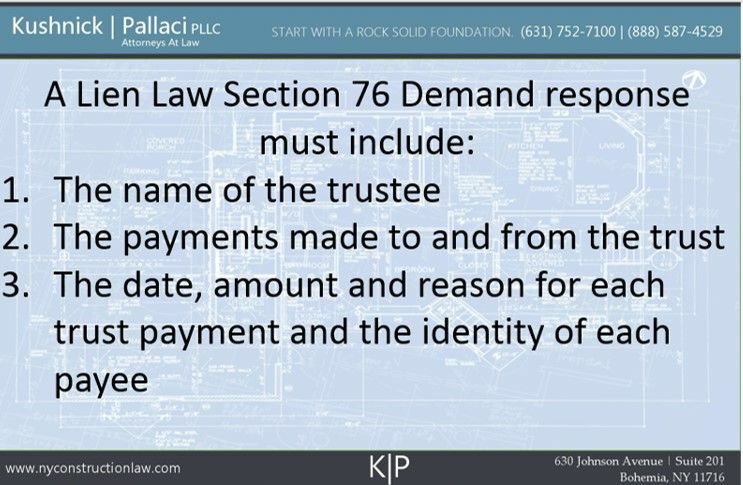 When a trustee responds to a Section 76 demand it should identify all of the information required to be kept in the books and records of the trust pursuant to Lien Law Section 75. This information includes each payment received in the trust, each payment made from the trust, the amount, date and reason for each payment and the identity of each payee. What information is required by Lien Law Section 76? The construction attorneys at Kushnick Pallaci have prepared and responded to thousands of Section 76 demands and prosecuted and defended special proceedings under Lien Law Section 76. When properly used, Section 76 demands can lead to claims for diversions of trust funds and expose corporate principals to personal and criminal liability. You can contact us here to discuss how we might be able to help you handle Section 76 issues. This entry was posted in Lien Law Section 76, Trust Diversion, Trust Funds and tagged Lien Law Section 76, Trust Diversion, Trust Funds by VTP. Bookmark the permalink.